Learn in the city. Lead in the world. The College of Arts and Sciences helps students develop their individual view of the world by acquiring scientific, social, and cultural awareness and offers abundant undergraduate and graduate opportunities for intellectual discovery. 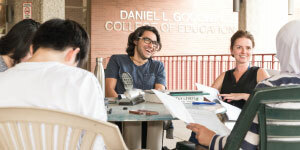 The Daniel L. Goodwin College of Education is one of the oldest and largest education colleges in the Chicago area, offering a comprehensive range of undergraduate and graduate programs. The College provides well-rounded general and professional education and extensive school-community clinical experiences. The College of Business and Management prepares students for successful careers in business and further study at the graduate level with faculty members from all corners of the globe. The College of Graduate Studies and Research offers an array of graduate programs to advance students’ educations when they choose to continue their studies. Finally! You’re going to college, and the possibilities are endless. What will your major be? Which clubs will you join? Will you study abroad? Only you can decide, but we can help you make some of the most important decisions about your future. Why should you choose Northeastern Illinois University? One of the most ethnically diverse universities in the nation, we provide our students an affordable, quality education with more than 70 undergraduate and graduate programs in the arts and sciences, education, and business. Northeastern offers extremely competitive tuition rates guaranteed for four consecutive years. Students from Illinois’s neighboring states pay in-state tuition, as do active military duty students, veterans, their spouses, and dependents. We help you identify grants, scholarships, employment, and loans so that when you graduate, you’re counting themoney you earn, not the money you owe. a balance between work, school,and life. Our 67-acre Main Campus on the Northwest Side of Chicago is a welcoming community to the more than 8,000 students who attend Northeastern. In addition to our Main Campus in the North Park neighborhood of Chicago, we also have locations inthe Avondale and Bronzeville neighborhoods and in Grayslake, Illinois. In fall 2016, we opened the doorsto our brand-new residence hall. Students can take advantage of our convenient location and unmatched amenities. The residence hall is located centrally on the Main Campusand includes features such as a fitness center, computer center, recreation lounge, billiards, foosball, air hockey, and much more. Knowing that college is an exciting and challenging time in life, we prepare incoming students with orientation programs geared toward first-year and transfer students, as well as a family orientation. These programs aim to support your transition to Northeastern and help buildyour foundation for academic success.Northeastern also integrates its First-Year Experience classes into the core freshman curriculum. These classes assist in the transition from high schoolto college, help improve your study habits, and identify your unique learning style. Once you get started at Northeastern, our faculty will prepare you to think critically, adapt to change, solve problems, and become a leader in your chosen field—qualities employers seek. Along your academic journey, internships and research opportunities are excellent avenues for exploring and gaining practical experience; they look great on résumés and give you a distinct advantage in any job search. We support student research through symposia, independent studies, and research positions. Northeastern offers several academic support programs, including the University Honors Program, which gives students an edge when entering the professional world or graduate school. This exceptional curriculum helps you develop and conduct a research or creative project such as an Honors thesis. 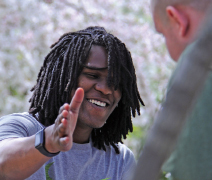 Northeastern offers student leadership and civic and community engagement opportunities. In addition to a lively arts community, there are more than 100 student organizations, including sororities, fraternities, and major-specific clubs for students in the arts, sciences, business, and education. And if you want to break a sweat? Northeastern has more than 25 team and club sports, fitness classes, and outdoor adventures. On the days you want to mix it up, spend a morning downtown shopping or visiting museums and then spend an afternoon stretched out on the University Commons studying. Northeastern offers students the best of both worlds—access to all Chicago has to offer and a retreat from its hustle and bustle. Northeastern’s Main Campus is located in a quiet community filled with residential homes on tree-lined streets. The diversity of Chicago is reflected within the shops and restaurants that are just walking distance from the University. Whether you’re craving sushi, falafel, tacos, or pizza, the city offers hungry visitors a variety of choices. Northeastern offers international programs where you can expand your horizons and explore new classroom experiences. Make progress toward your degree and learn about new cultures while you spend a semester (or a year) studying at one of our partner universities in Colombia, France, Germany, Korea, Japan, Poland, Spain, and many other countries. Classes are paid for by your regular tuition; your financial aid may apply, and there is a range of possible scholarship opportunities. We also offer study abroad programs that range in length from one week to one year. Experience travel while you receive course credit for pre-approved classes. Our advisors are happy to help you find a study abroad location that fits your program of study, budget, and desired level of cultural immersion. Short-term course-related study tours range between one and six weeks in length. Offered by Northeastern faculty members from various departments, these study tours can offer you an international experience as well as course credit that could count toward your major. At Northeastern, you’ll make friends from all walks of life, but your experience isn’t limited to your time on campus. Take advantage of the University’s connections to explore all of Chicago’s cultural and professional opportunities. Now that you’ve taken a closer look at our University, come see for yourself what Northeastern has to offer. Find out about our admission process and visiting options at neiu.edu/visit.